Maureen Cavanaugh @ 31 Grand, L.E.S. 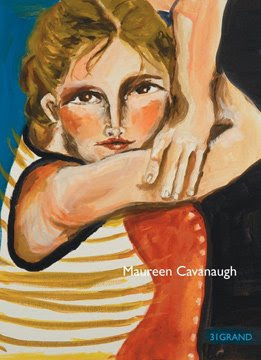 Tonight I went to Maureen Cavanaugh, “Stay With Me” at 31 Grand. Just now as the title “Stay With Me” jumps out in black and white text, I think of the band Shakespeare Sister and a song that they had by the same name…popular in the 90’s. Okay, looking it up…specifically 1992. Maureen’s exhibition will be on view at 31 Grand from November 13 – December 14, 2008. Her work makes me think of process, place and surface, all while exhibiting a contemporary take on a traditional mode of painting. A favorite of the evening is a portrait of Hillary Clinton which is so beautifully constructed in its simplicity and close to home, reminiscent of our current political progressions. I also enjoyed the small sculptures that are rife with Maureen’s hand. Her colors, markings and stylizations have been transferred from the painted surface, miniaturized and displayed on wooden shelves that project at a 90 degree angle in the center of the space. From the 31 Grand website: Paintings are assembled to create a tapestry of woven stories and ideas. What the artist calls her “compulsory paintings” are small studies that allow her to investigate subject matter on an intuitive level. Assembled together in a large-scale collage, the images include brightly colored still lives of flowers, a twirling dancer, reclining girls, a dying plant. Like small, tightly cropped snapshots, they display a delicate fragility with the tender treatment of the subject matter. Shakespeare Sister, “Stay”, Good times. I bet these chicks wore crystals too, especially the “evil” one dressed head to toe in glitter. Earlier this evening in Brooklyn, the air was damp. A cool breeze whipped between the buildings as I walked from 4th Avenue to 5th Avenue. 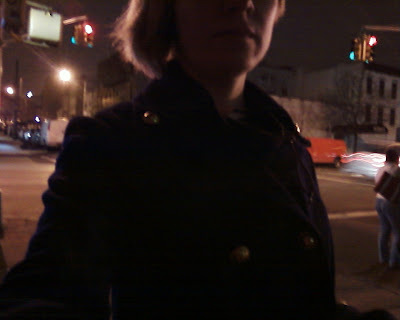 New Territory and the first temperature appropriate day of the season to wear my vintage navy coat, with gold star buttons.